RUBY C. PACIS, CEO &amp; FOUNDING PRESIDENT, FAITH IN GOD RPM PROFESSIONAL AND TECHNICAL SERVICES CORPORATION was selected one of the 100 Most Influential Filipina Women in the World by the Filipina Women's Network. Pacis was selected from an outstanding field of nominees from around the world. 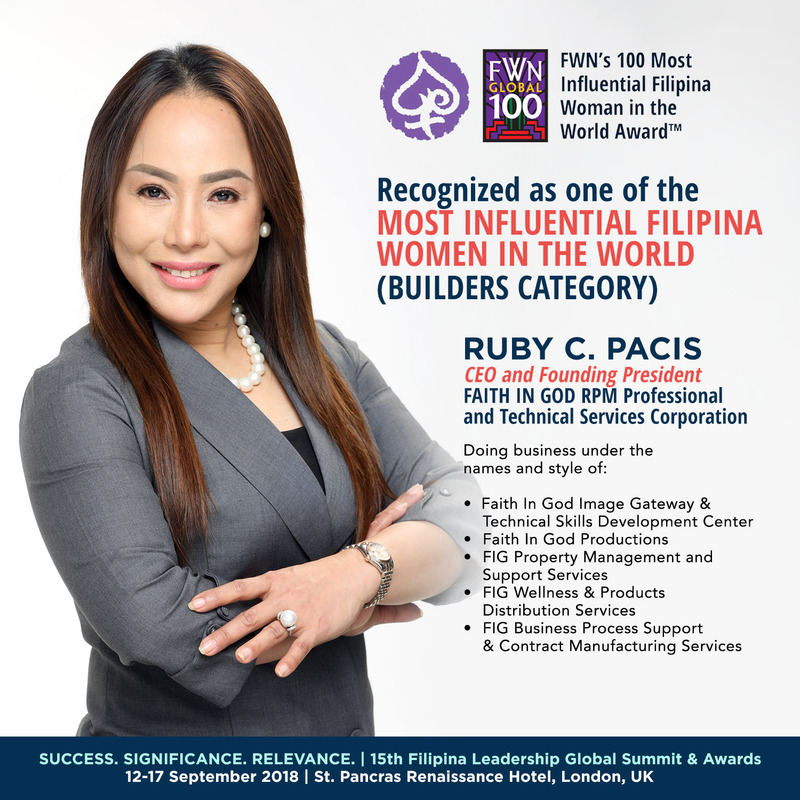 She was recognized as one of The Global FWN100 under the Builders category. These are the Filipino Women who have demonstrated exceptional business impact at a large workplace environment; displaying deep passion for a cause through collaborative initiatives or alliances with nonprofit organizations on behalf of her own organization; demonstrates high potential and skill with measurable results at a government agency, or organization in the public and private sectors. "Buildership" is about building better organizations, leading broken organizations to adjust, repair and re-align. of qualified leaders to increase the odds that some will rise to the "president" position in all sectors of the global economy,&quot; added Dr. Maria Beebe, FWN’s board chair. "The summit is where smart women are sharing the secrets to their success and inspire each other. The 2018 awardees’ leadership stories become part of the largest recorded Filipina women diaspora in modern times." awardees on stage at the awards ceremony assures me that the future of our young Filipina sisters is solid,” said Susie Quesada, president of Ramar Foods International and FWN president. “As a leader, you should be responsible to practice values you want others to follow. Establish your feet in the Lord and rely on His unending grace. For there is no such thing as "shortcuts"- you will get hurt, you will encounter sleepless weeks and you will be pressed as hard as you could possibly feel... but beauty comes after brokenness. Your experiences will mold you and fill you until you become the person you are destined to be. Time will come, you will be the one who will heal others. For I believe, life is not about how famous you are but how other people think of you after you crossed their paths,” says Ruby Pacis.